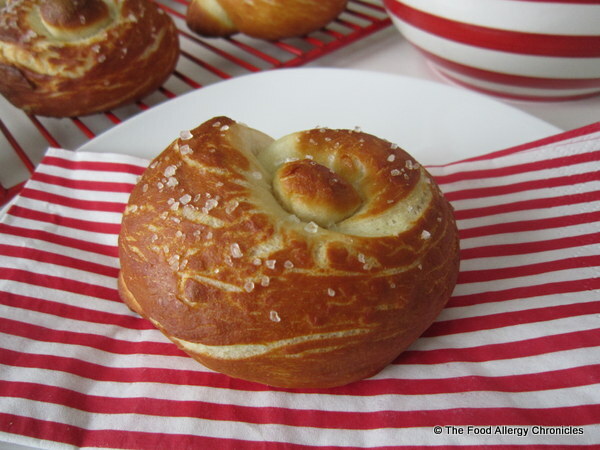 Posted on February 1, 2013 by Susan H.
I have another allergy friendly ‘bread like’ recipe to share…perfect for the weekend…perhaps, something to munch on during SuperBowl Sunday 2013! Hot and fresh…right out of the oven! I discovered the recipe in the March 2009 Bon Appetit Magazine awhile ago…it was in their readers’ favourite restaurant recipe section. This recipe comes from the restaurant Cut in Las Vegas. 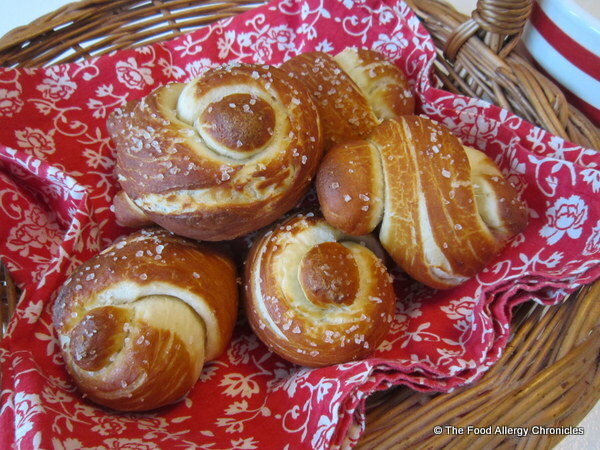 The reader stated, “…when we sat down, we were served delicious pretzel rolls straight from the oven. Can we get the recipe?” Click here for the original recipe. 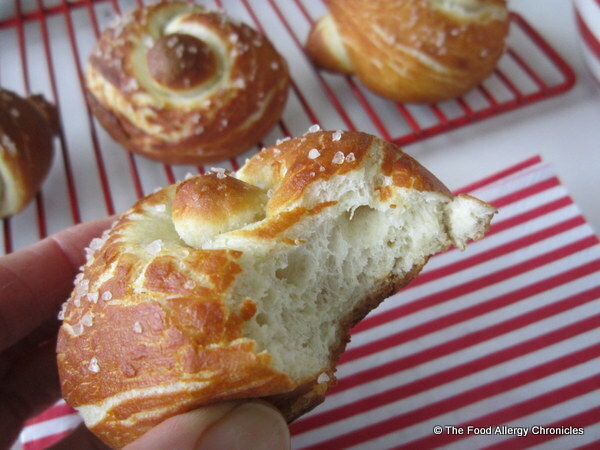 I have been waiting for just the right time to bake them…like the bagels, they take a bit of time management. Monday morning with the boys off due to exam week seemed like the perfect time to surprise them with fresh from the oven Dairy, Egg, Soy and Peanut/Tree Nut Free Pretzel Knot Buns. I only needed to adapt the buttermilk…replace the buttermilk with 1/4 cup Natur-a Soy Beverage or Natur-a Rice Beverage mixed with 3/4 tsp white vinegar and let sit to thicken. 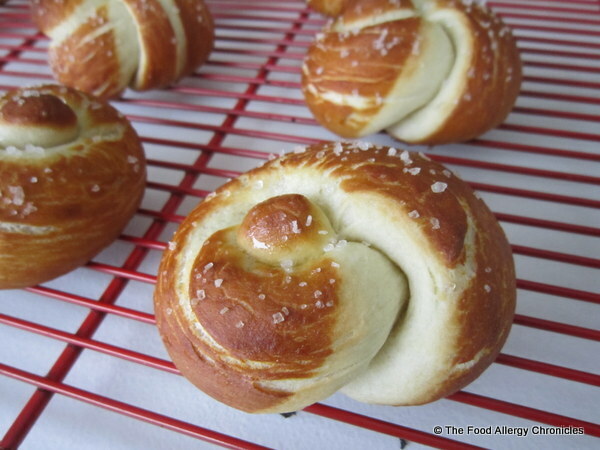 Dairy, Egg, Soy and Peanut/Tree Nut Free Pretzel Knot Buns. 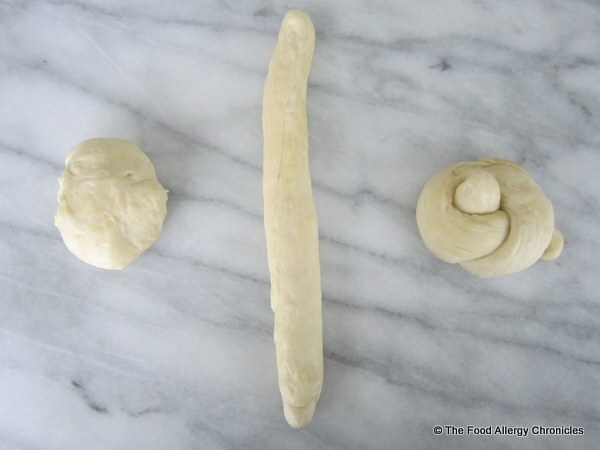 Forming the dough into 8 balls, rolling into a log and tieing into a knot. I found it easier to roll without any flour on my marble slab. 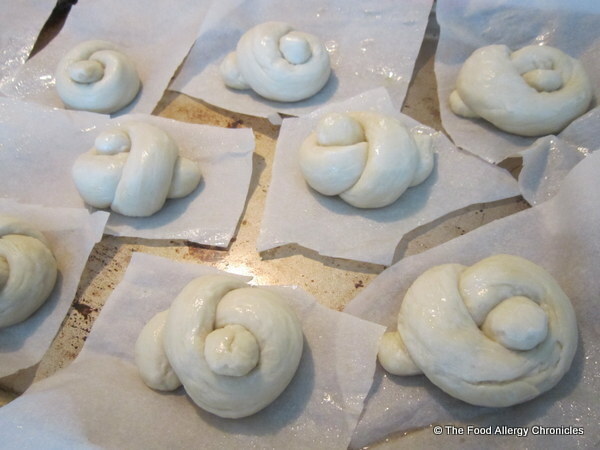 Dairy, Egg, Soy and Peanut/Tree Nut Free Pretzel Knot Buns ready to be slipped into the simmering water. I found I just carefully picked them up and placed them in the simmering water…much easier. 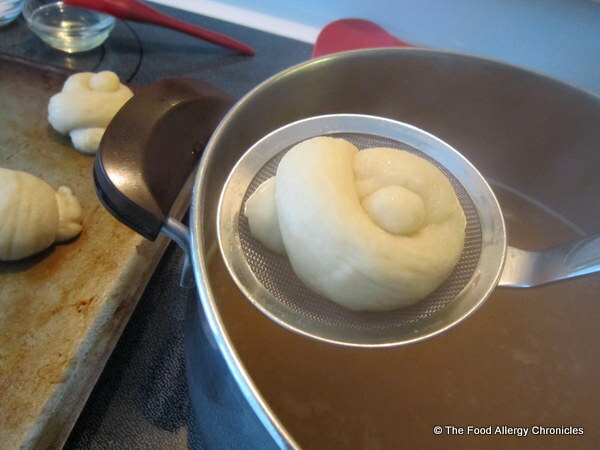 Removing a Dairy, Egg, Soy and Peanut/Tree Nut Free Pretzel Knot Bun from the simmering water to place on a greased baking sheet. Poaching for 10 seconds a side goes by fast! 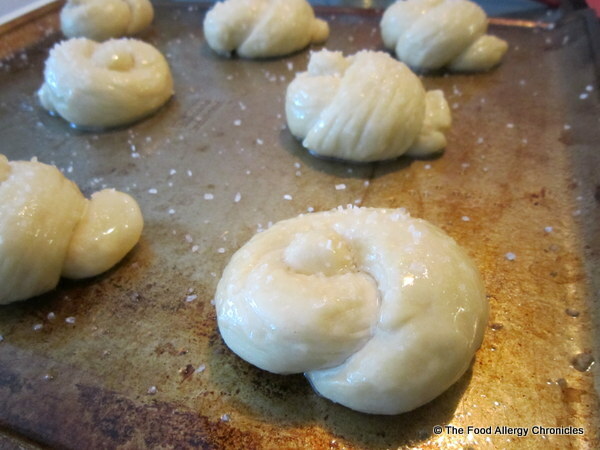 Brushed with canola oil and sprinkled with some coarse sea salt…they are ready for the oven. My boys were not keen on all the salt…I would either replace with a less coarse salt or omit altogether…depends on one’s taste for salt. Hot from the oven…ready to eat! Check out the golden brown colour…”How did you get it that colour?’, mused Michael. P.S. My boys found, the next day, the salt had seeped into the dough…the added salt flavour was not to their liking…tasted better when warmed up a bit in the microwave. Victoria and William, on the other hand, loved them…salt and all! P.P.S. Overall, William and my boys much preferred the Dairy, Egg, Soy, Sesame and Peanut/Tree Nut Free Bagels…Victoria was not around to try them. Click here for the post. Will you be one of the many watching the SuperBowl this Sunday? What is your favourite ‘munchy’ for the SuperBowl? This entry was posted in allergies, baking, breads, dairy free, egg free, lunch, multiple food allergies, peanut/tree nut free, sesame free, soy free and tagged Bon Appetit Magazine, Dairy Egg Soy Sesame and Peanut/Tree Nut Free Pretzel Knot Buns, Natur-a Rice Beverage, Natur-a Soy Beverage, Vegas' Cut Restauarant's Pretzel Rolls adapted to be dairy free by Susan H.. Bookmark the permalink. Oh those look sooooo good!! I wonder if they’d turn out the same with GF flour. I’m drooling.. haha! I’m a salt addict, so the salt looks great to me!